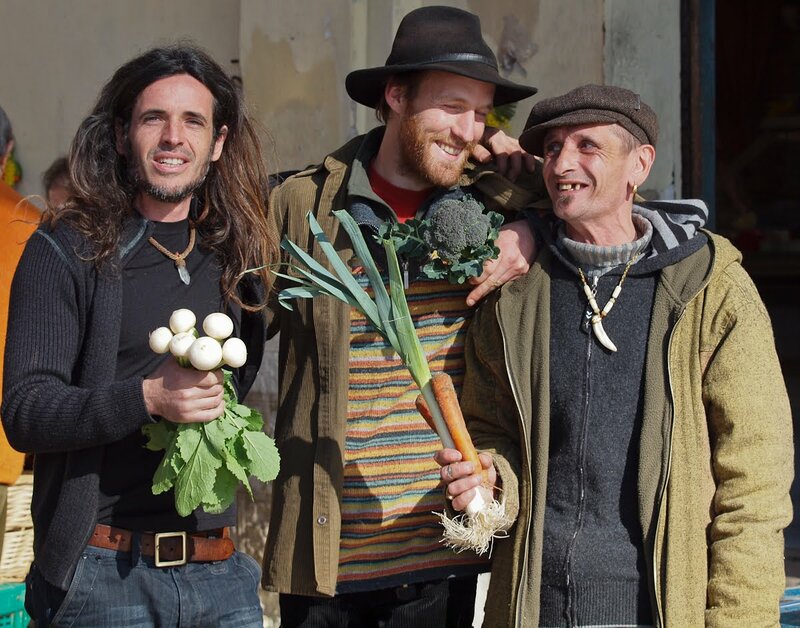 We're outside Menton's market where, each Saturday, you'll find Philippe Guiglionda (on the left with long hair) selling his fabulous organic fruit and vegetables. In 1998 Philippe bought a sundrenched piece of land above the village of Gorbio to grow fruit and vegetables without chemicals and using natural compost and manure. Gradually his business has grown and now you'll see a line of regular clients queueing each Saturday for the fresh and healthy produce which he picks either the night before or that same morning. He also sells to some of the top chefs in Monaco and supplies specialised shops as well. In the photo, Philippe posed alongside two friends - all of them from Gorbio - hence the title! Nous sommes sur la partie extérieure du marché de Menton là où chaque samedi, vous trouverez Philippe Guiglionda (sur la gauche avec les cheveux longs)qui y vend ses excellents fruits et légumes biologiques. En 1998, Philippe a acheté un terrain baigné de soleil au-dessus du village de Gorbio pour y cultiver des fruits et légumes sans produits chimiques en utilisant seulement du compost et du fumier naturels. Peu à peu, son commerce s'est développé et maintenant chaque samedi matin, vous pouvez voir une file d'attente de clients réguliers amateurs de ses bons produits frais et sains récoltés soit la veille soit le matin même. Il fournit également certains des plus grands chefs de Monaco et des commerces spécialisés en produits bio. They seem to be very good friends! It's nice to see people happy together! I think I am in love with all three of them. What a wonderful moment captured, Jilly. May sweetness rain down on you today like sunlight. This is such a great portrait! I love it. Bravo Philippe pour cette belle initiative couronnée de succès. and bravo jilly for yet another brilliant portrait. You caught a smile on every face and a gorgeous spirit ! Very nice, colourful and fun shot! Yay Philippe!!! I love our local organic farm produce that is sold at our farmer's market in the summer!!! The best white peaches I've eaten since I was a child...and our produce man used drive his truck through the neighborhood with wonderfully fresh produce!!! It is a great portrait, because each man is relaxed, natural and enjoying the moment. Nice one. For people like me, who sit at desks and keep the wheels oiled in faceless global companies, the idea of a simple life of quality and usefulness is quite compelling. Nice shot. I'd love to meet these guys! Perhaps I'll get that opportunity sometime. In the meantime, I wish them much success! Hi Jilly, i love this photograph. It has so much energy. Just like you. Love from The Prairie to you on The Riviera. xoxo.